Tabber is jquery based lightweight plugin for Vantage to add clean, responsive and structured tabs to show specific custom fields as tabs on listing or event detail page you’ll be able to show custom fields of your choice as tabs on the listing or event detail page. The label you set one will be used as the tab name and the value visitors provide while, submitting the listing or event will be used as content for the tab. For the best utilization of the webpage, tabs are one of the most effective way to show more content in less area. 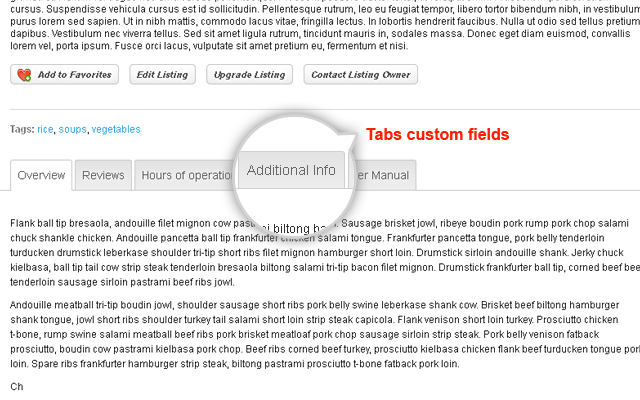 The Tabber plugin fully integrates with existing custom fields you can transform your existing custom fields into tabs on the listing or event detail page. All you need to do is click on the appropriate option while editing the custom form and the field is ready to go. Field types that works best here are Text Field, Text Area , Radio , Checkboxes and Select List only it will not work with File upload field. You can use Fields Touch and Tabber plugins simultaneously. 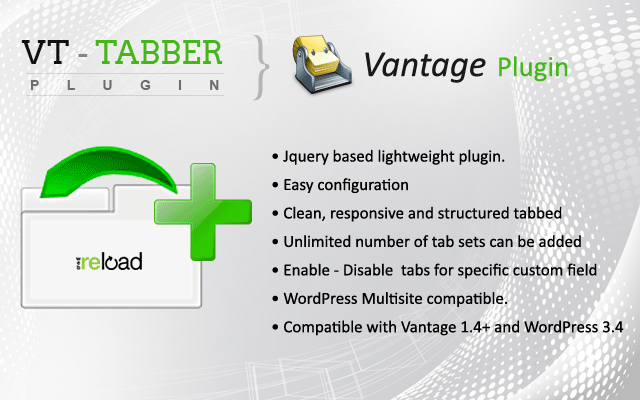 How to use Tabber for Vantage? Install Tabber on your site then follow below steps. First you have to make sure that you have created a “Custom Form” for your site. If you have not created “Custom Form” then you need to create. 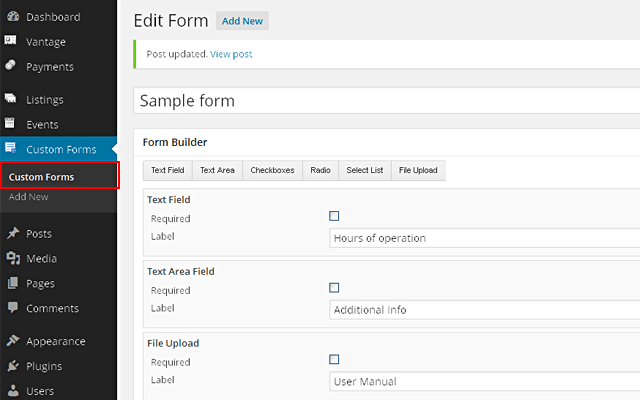 Custom Forms are created by clicking on the Custom Form link on the left column of your WP backend (wp-admin –> Custom Forms). Once you have started a Custom Form by adding a “Text Area” field or “Check Box” field you may have to click update. After update you scroll down below where you are creating your custom form and Tabber will have a label corresponding to the fields you have created with a check box out to the side. If you click on any of the checkboxes it will make it so that particular field shows up as a tab on your website listing or event page. 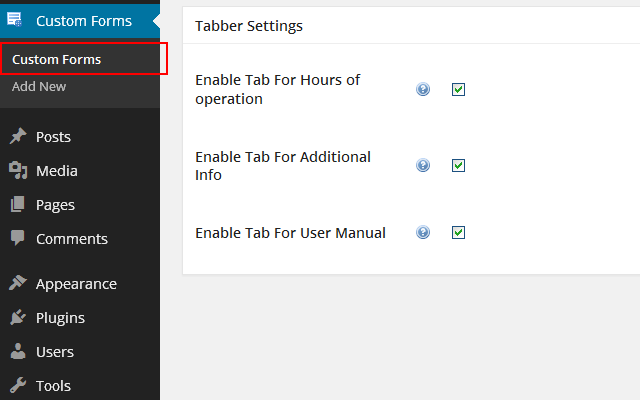 Go to wp-admin –> Custom Forms Add OR Edit Form see at bottom of page “Tabber Settings” to enable or disable tabs for specific custom field. Hi Ahmed, just want to say a big thank you for producing this great plugin at a very reasonable price. It’s saved me hours of coding work and I’m looking forward in getting my first directory out on the web very soon. I was hoping that a theme update would address the issue of congested content when a lot of content is put in the custom forms fields. However Tabber came along and addresses this issue perfectly. It’s a great idea to get Tabber if you want to neatly add additional content in your custom forms areas. Just installed the ‘Tabber’ plugin. It’s simple and effective allowing potential listings clients the space to write as much as they wish about their company in a clean ‘tabbed’ style. Ahmed the developer is very helpful and I’m sure my clients will be very pleased with the flexibility this plugin gives your listing. 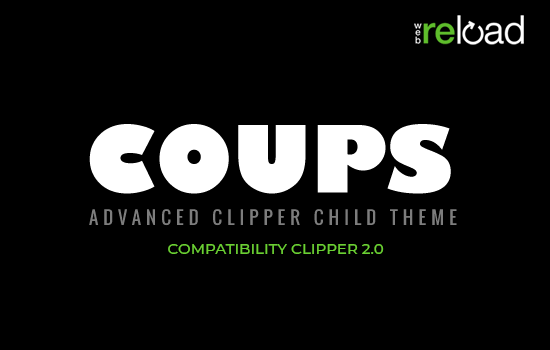 This is a simple yet very effective plugin. It basically cleans up the page. On my site it did look crowded with different fields filled in with the listing information. Now however you can list as much info as you want yet have it put under their own sections using the tabs. My website looks much more professional and less clogged up with information. If you are thinking of buying this plugin, don’t think just do it..!! It’s different thing what you are looking for it’s not trick. I don’t know why my comment didn’t nest, however was a reply to Curtis’s question re: TinyMCE. I added a few custom fields on my site and assigned them to different tabs which all worked well. However I have cheesing “Add your review” under each tab. Can you please tell me how to fix it. I am not able to attch my screen here but you can see the issue at my site http://www.apkaindore.com. There is a listing there “Test” on the first page which has different tabs and “add a review” under each tab. It’s add review section for each listing it will always appear at bottom of tab it’s by default vantage listing review functionality you can on/off review from vantage settigns. Thanks Ahmed for your prompt reply much apprecaited. However I cant seems to find where to turn off reviews in Vantage for listing page under Tabs (have disabled review from all other pages). Can you tell me where to do it. If I install this plug-in and add a custom field called “Booking Offer”, and then add a tab called Booking Offer to the listing or event, can that tab contain an image which can be printed (a coupon with a booking offer on it), or, does the information on that custom tab have to be text-only? By default some html tags allow in Vantage only for textarea custom field through html allow setting i didn’t check it’s allow image or not. if it will allow then you need to add full image tag code not only image url. I understand — the html code for displaying an image, the same as if it was in a widget. That makes sense. Thank you. Can you make it possible to embed music and videos into the tabs? I asked in the MOD section to add an “embed” option when making a form but I got no answer in the forum. I have created a custom form with multiple elements, checkbox groups, text areas etc. I want the entire form to be available in just one Tab area, however the tabber settings ask if I want to enable a different tab for each element? Hi, im currently using vantage plus bfinder child theme, do you think it will work with this child theme?? i want to fill a lot of ugly empty space in the layout of the listings, i like your tabs to fill that empty spaces in listings. I see in your demo the gallery of images are not showing, why is this? I need this plugin, but I need to know how do I change the color of the tabs (active tab and non-active tabs). Do I need to create a child theme and make changes to the style sheet? Thanks. Hi there, is it compatible with Vantage 4.x? Hi there, is it available in the download area? I just purchased it, activated and it crashed the listings in my site. Is the latest version ready or not for Vantage 4.x? Great! Just purchased it and I can’t use it at all. Do you know when it will be ready for V4? Otherwise, I would like to get a refund. Thanks. Hi there, any idea what I do with this plugin if it doesn’t work on my Vantage 4.x?